← What Happens When It Rains? Callebautâ€™s designs are certainly fantastical, but itâ€™s a treat to ponder them and hope that someday this type of utopian technology will actually exist. His newest vision is a floating environment filled with gardens and covered by both a green roof and thin-film solar panels. Hydro-turbines generate power from the moving water underneath the boat, thus, all of the boatâ€™s energy is generated from renewable sources. The craftâ€™s exterior features a layer of TiO2, which reacts with ultraviolet rays to clean the water. Additional water is pumped through the garden systems, which biologically filter out contaminants and pollutants. Inside there are four distinct thematic gardens named, â€œEarthâ€, â€œWindâ€, â€œFireâ€, and â€œWaterâ€, which represent the four elements. 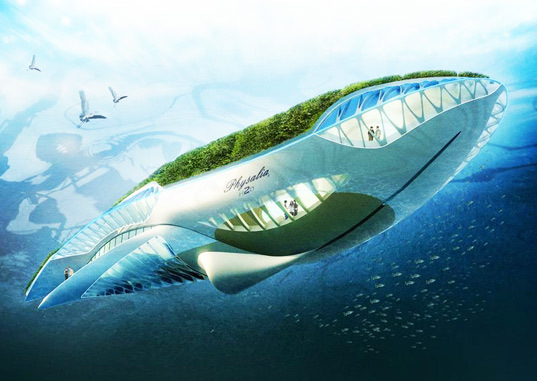 This entry was posted in Design!publiC, Interesting Ideas and tagged architecture, green design, inhabitat, innovation, sustainable, water purifier. Bookmark the permalink.